Having pets is both amazing and exhausting. Both Katherine and I have house cats that require exercise everyday to help with boredom and to channel their crazy energy. 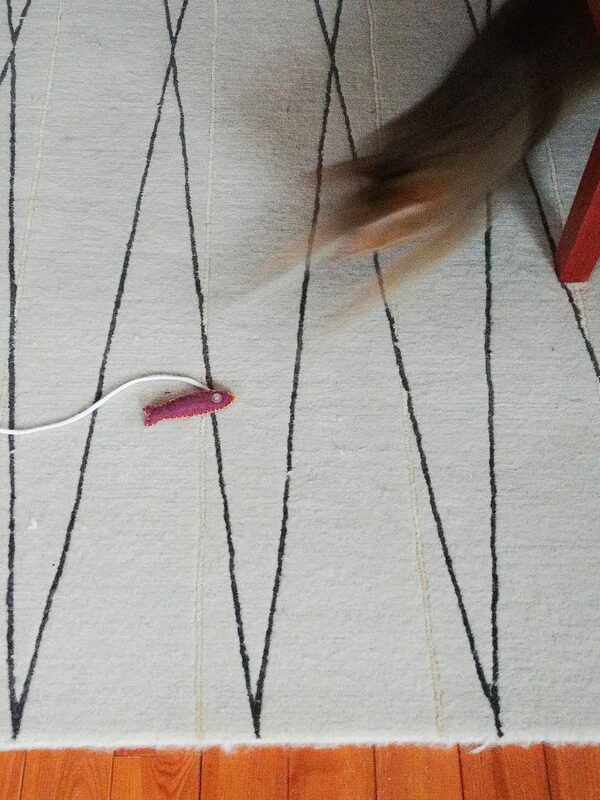 So today we bring you an easily made distraction for your own cat: a DIY cat toy. 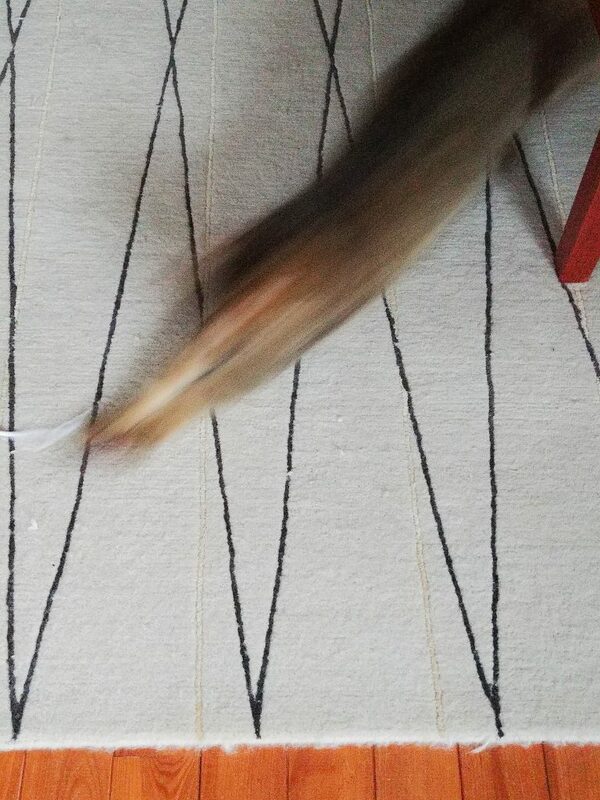 Anyone with cats ever buy those string cat toys from the dollar store? You know the ones. The plastic handle, fiber covered elastic with a little ball and feathers at the end. I was purchasing them for a while, but never felt good about letting my cats play with them. From them chewing on a styrofoam ball, to the feathers that came off easily (which they tried to eat) and then the plastic handle. Why do we always use plastic for toys?? They break after a few uses and then we’ve added to the ever increasing amount of garbage in landfills. 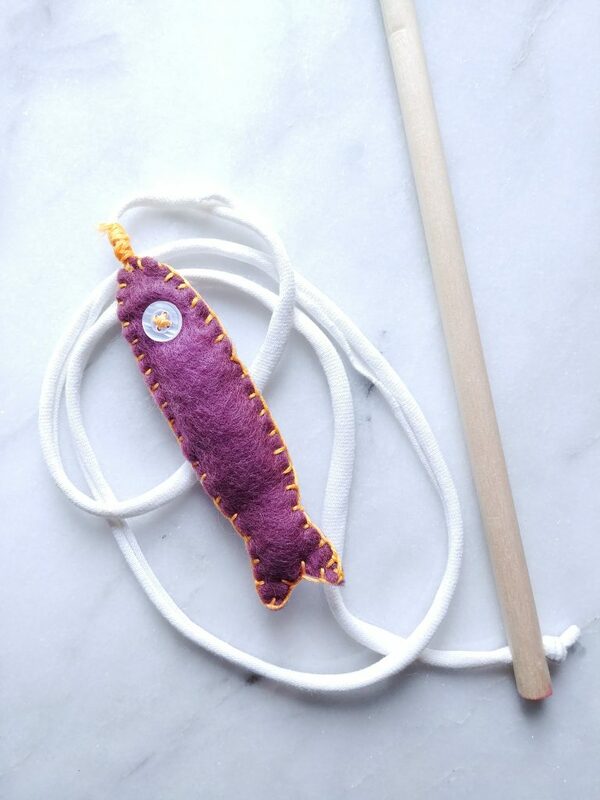 So today we are showing you a toy that you’ll feel good about giving to your feline friend! 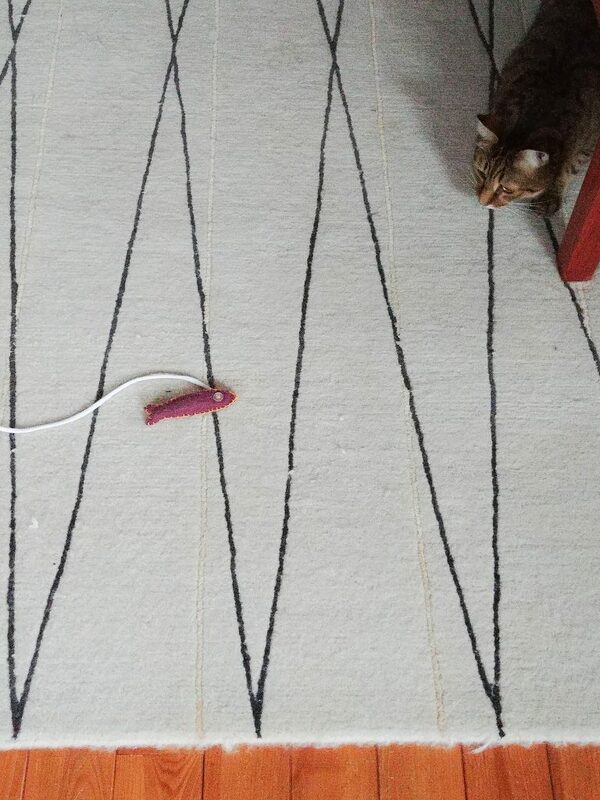 We tried to make this toy as eco-friendly and feline friendly as possible. We added two little button eyes to make it look cute; however, this is totally unnecessary. Even though they are really sewed down with embroidery thread, we’ll have to monitor the cats closely to make sure they don’t bite them off. As an alternative you can use a marker to draw on eyes, just make sure the ink is okay to consume. Or have a eye-less fish, after-all they do exist. What is T-shirt yarn? Well it’s a clever way to take an old t-shirt and give it new life! Use this demonstration to make your own. Reusing household items that have lost their use helps keep the cost down for the toy. The cost was around $2-3 to make. Only the dowel, felt and embroidery thread was purchased. The stuffing came from a pillow the cats destroyed (cats are fun) and the cat nip from a previous cat toy. Step One: Print off our fish template onto cardstock and cut out the fish. 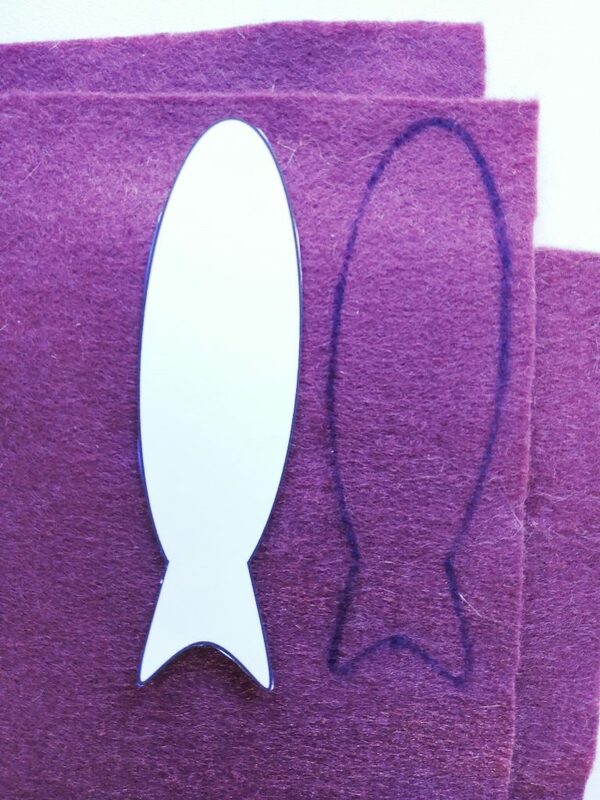 Place the cutout fish on the felt and trace around it with a marker twice. Cut out both felt fish tracings. Step Two: Cut a 5-6 foot length of embroidery thread, tie a knot in one end and thread onto a needle. 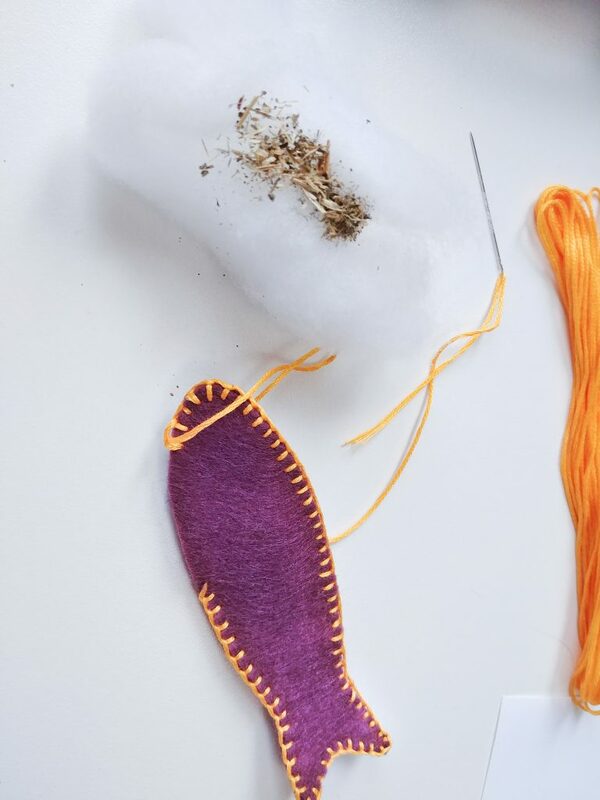 We are going to be doing a blanket stitch to sew the felt together. Align the two pieces of felt together, you will start sewing at the top “mouth” point of the fish, not where I started in the picture. This makes it easier and cleaner looking at the end. 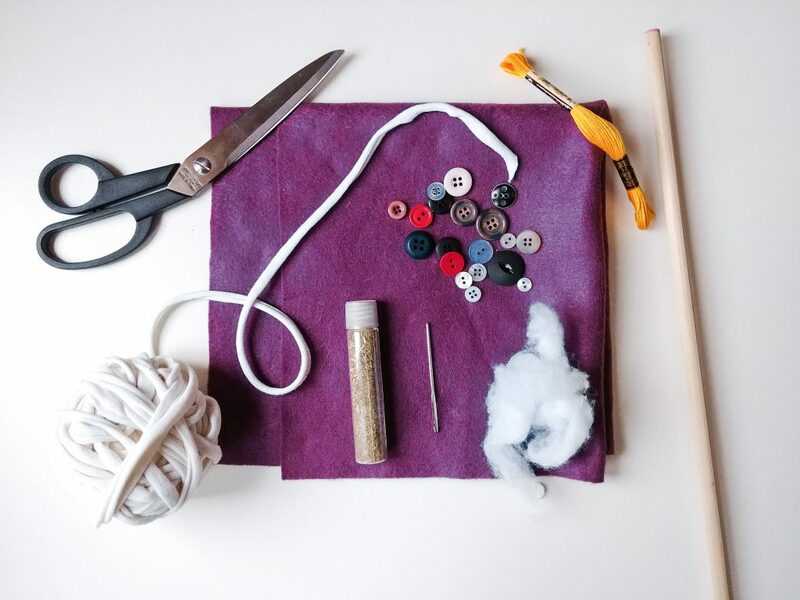 Bring your needle up through the inside of the top piece of felt, towards yourself. 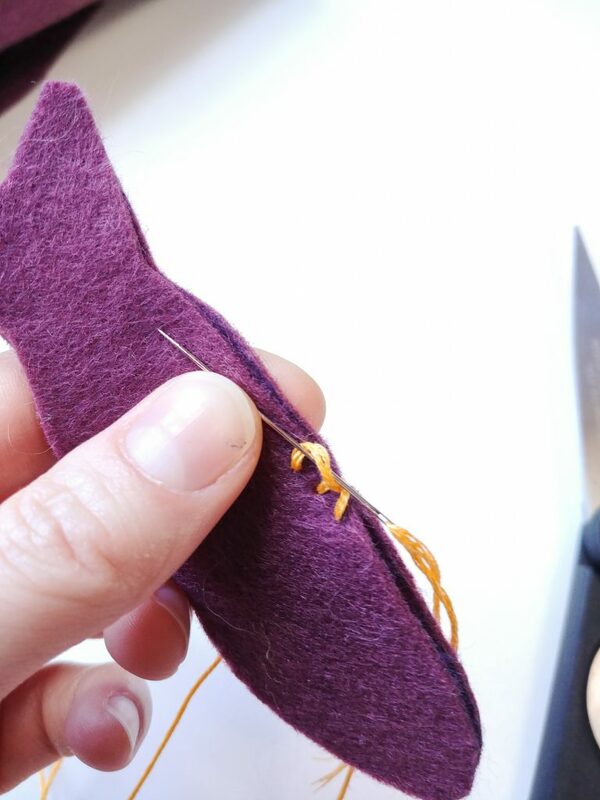 Pull all the thread through until the knot is between the two pieces of felt. Insert the needle adjacent to where the needle came out, and push through the two pieces of felt. 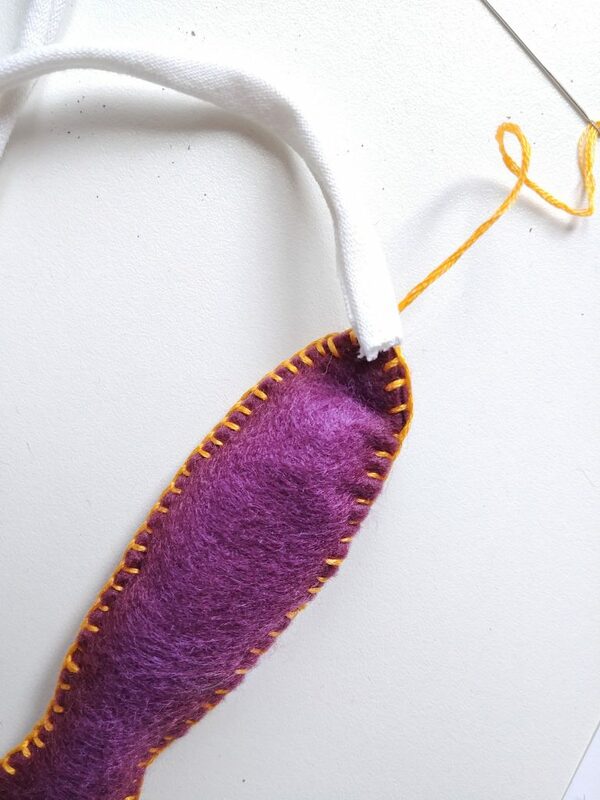 Gently pull the thread through so that there is a loop left as shown above. Next bring your needle through this loop and pull tight. I find wiggling the thread back and forth helps tighten the stitch. Remember, you are always inserting the needle on the same side of the felt. Repeat this stitch around the fish, stopping when you get halfway up the other side of the fish to leave an opening for the filling. Here’s a YouTube tutorial if you are confused, just know I sewed to the left and the video shows to the right, but it really doesn’t matter how you do it. Step Three: You should have something that looks like the picture above. Hopefully you will have started at the top and not the side like I did😜. Grab a piece of stuffing and top with a small dusting of catnip if using. Then fold the stuffing over the catnip and stuff into the fish. Use a pen or something similar to poke bits down into the tail. You may want to start with small pieces of stuffing to put in the tail first, then add the larger piece of stuffing. 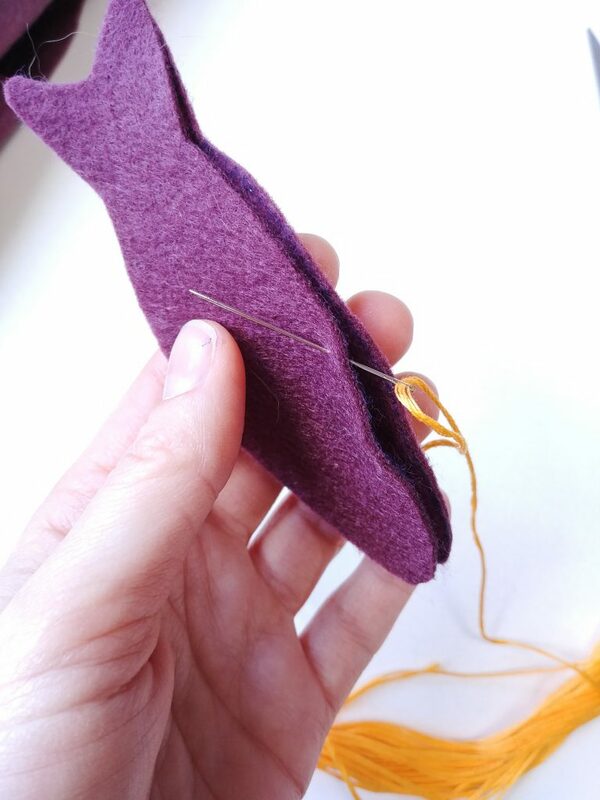 Once the stuffing is in, pinch the sides of felt together and continue with the blanket stitch all the way to the top. Tie a knot in your thread. Step Four: Cut 2 1/2 feet off t-shirt yarn, bringing one end to the tip of your fish. Sewing through the yarn and felt a few times, then begin wrapping the thread around the two many times. You want this to be strong as your cats will be hauling on it. 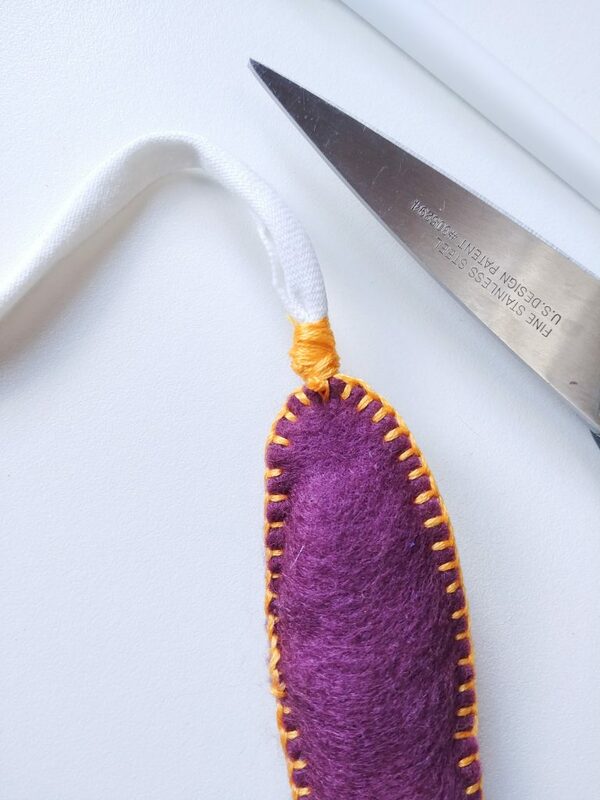 Once you have it wrapped sufficiently, pierce through the felt and yarn again and tie a double or triple knot. 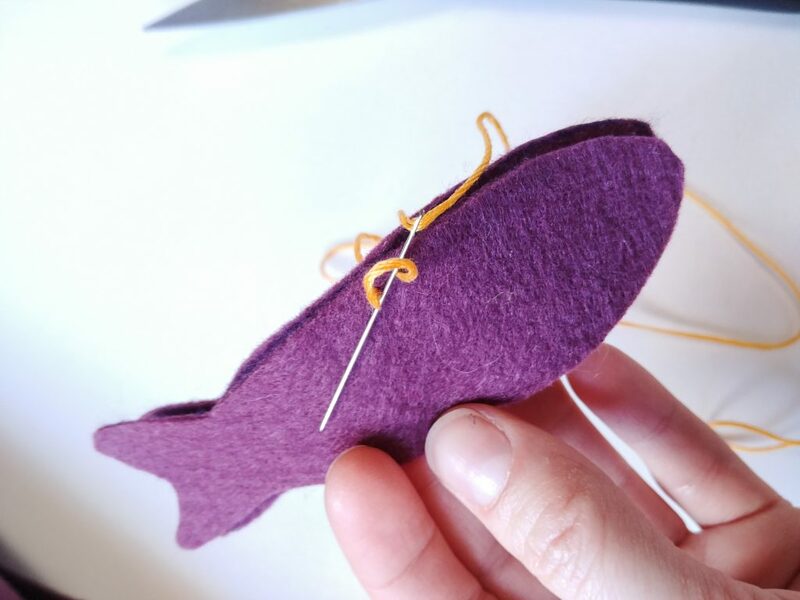 If desired, sew the buttons onto the fish near the head, making sure you use lots of thread, hiding the knots under the buttons. Step Five: Cut your dowel with the saw to two feet in length. Then preferably using clamps to hold the dowel still, drill a hole near one end of the dowel. Use sandpaper to smooth away any rough bit of wood. 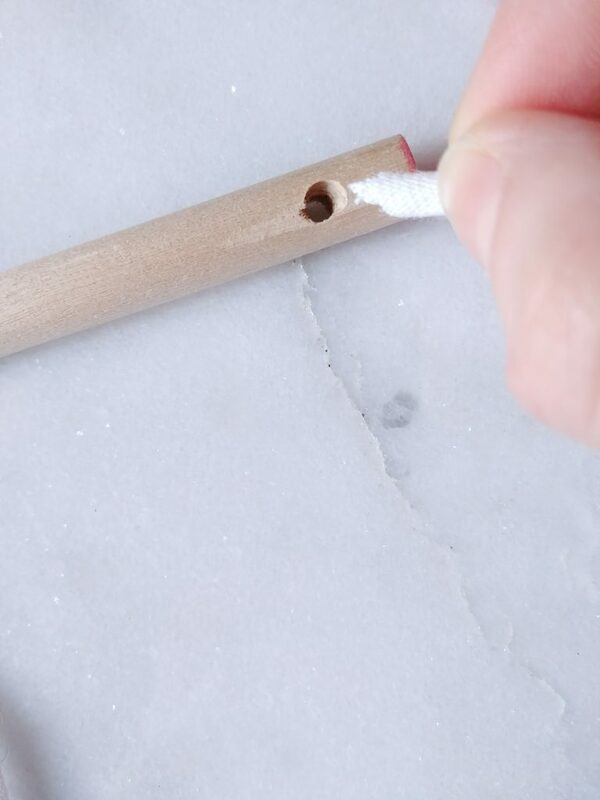 Take the free end of you T-shirt yarn and push it through the hole in the dowel. Tie a tight knot in the yarn, cutting away any excess yarn beyond the knot. And you’re done!! 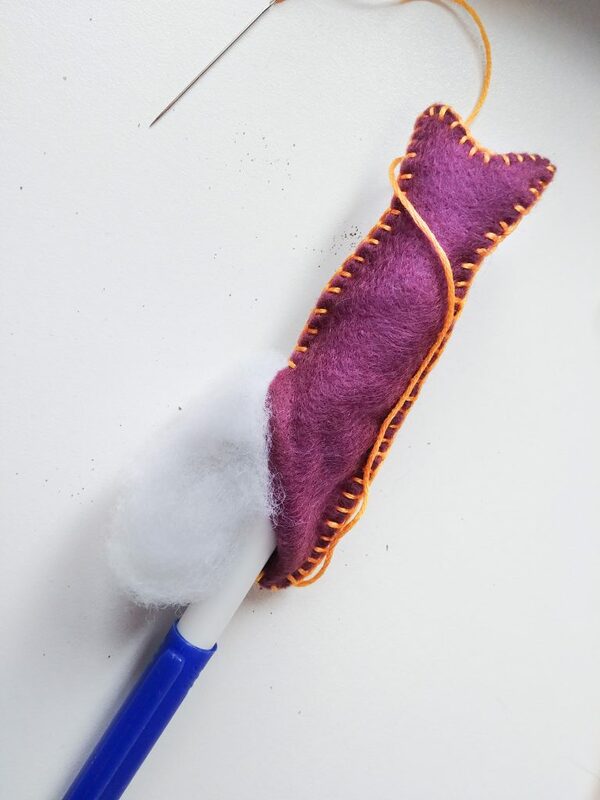 Hope you enjoyed this DIY Cat Toy tutorial, let us know if you tried it out! Remember, never leave a cat toy out unattended. This could result in the cat ingesting part of it or becoming entangled which could be fatal.